Do you believe in fairy tales? In a world of Evil Queens, Jiminy Crickets’, Rumplestiltskins’ and Prince Charmings’ – the Digital Studio Services sound crew from Once Upon A Time helps to make us all believers. Fairy tales collide with the real world in ABC’s new hit series and the sound is just as epic as the characters that inspired them. A modern take on Disney’s classic fairy tale, Once Upon a Time thrusts some of our favorite characters to “some place terrible” otherwise known as the real world where, as a consequence of the Evil Queen’s curse, all happy endings are taken away. The show comes at the conclusion of the award winning series LOST, which was also created by master story tellers, Edward Kitsis and Adam Horowitz. Disney Digital Studio Services got the opportunity to talk with Co-Producer, Brian Wankum about the new series and what it’s like to produce a show that pays homage to so many Disneyesque themes right here on the Walt Disney Studios lot. We also got a chance to sit down with the post production sound crew, including Disney Digital Studio’s Re-recording mixers Mark Fleming & Tom Dahl, Recordist, Erik Flockoi as well as Supervising Sound Editors, Tom de Gorter & Joe Schultz, a for a look at what makes the sound on Once Upon a Time tick. Brian Wankum, now on his second project with Disney/ABC Studios, couldn’t be happier to be back on the studio lot. With over 15 television series under his belt, Wankum is thrilled to work on such an original show with a studio that is no stranger to stories that begin with “once upon a time”. “There are a lot a great places we could have mixed the show, but being here at Disney where the classic versions of Snow White, Pinocchio, Cinderella and others were made lends a certain gravitas to what we do on Once Upon a Time. ” Wankum asserts. There are a lot a great places we could have mixed the show, but being here at Disney where the classic versions of Snow White, Pinocchio, Cinderella and others were made lends a certain gravitas to what we do on Once Upon a Time. And as suitable as it is to produce Once Upon a Time on the Walt Disney Studios lot, it’s just as fitting to mix the sound on Stage C where his first ABC Studios project, Eli Stone was mixed. Home of re-recording mixers Mark Fleming, Tom Dahl and recordist Erik Flockoi, Stage C has cranked out a slew of such recent shows such such as Falling Skies, Fringe Detroit 1-8-7, Flash Forward, and Eli Stone and to name a few. New to Wankum, but not new to Disney/ABC Studios are sound supervisor Joe Schultz and Emmy Award winning sound designer, Tom de Gorter who was also the supervising sound editor on the series, LOST. Fairy tales often have their own themes and acoustically, this is very apparent in this show. 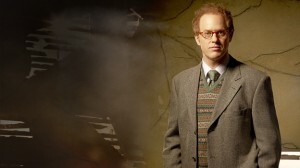 Dr. Hopper aka Jiminy Cricket for example, eventually brought back the crickets in Storybrooke. Perceptive ears will notice an absence of crickets in the first few episodesuntil Dr. Hopper finally decides to listen to his conscious, accoding to mixer Mark Fleming who is responsible for the dialogue and sound effects mixing on the show. 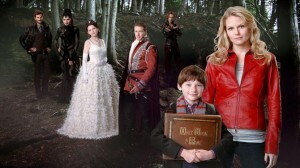 Once Upon A Time airs on ABC on Sundays, 8pm/7pm Central. Don’t miss it!